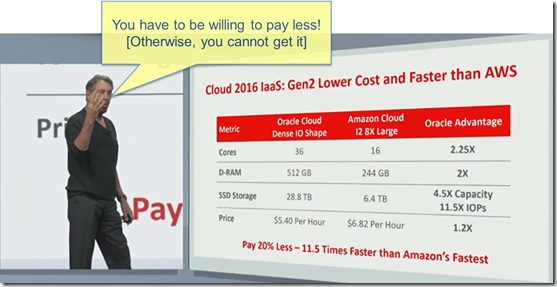 The key theme of Oracle OpenWorld 2016 was Infrastructure [as a Service]. Bigger, better, faster than Amazon WebServices – and cheaper as well. That was the message Oracle tried to drive home. Coming from behind, leap frogging the competition in IaaS and PaaS by using the latest generation of technology to create “a generation two data center” with focus on smart, predictable and fast network (< 100 micro second latency and soon 25 Gb bandwidth ), isolated virtual network (software defined), large and fast NVMe storage and large compute shapes – available through a Bare Metal Cloud Service: you get your very own raw and fairly big iron with any operating system and very large workloads. Hiring infrastructure architects from Microsoft Azure and Amazon Web Services to benefit from all lessons learned the hard way and doing things right the second time around makes sense. The improvements Oracle introduces are convincing – although the competition keeps moving as well. By comparing itself to AWS all the time, Oracle very cleverly positions itself as perhaps not the number one but at the very least a very strong contender. In actual fact, Oracle’s market share in pure IaaS revenue puts it well behind not only AWS but also Azure, IBM and Google. It would seem that at the high end of large compute shapes and extremely large workloads the Oracle offering really can have a winning differentiator. The quality, scalability and manageability of its infrastructure is crucial to its PaaS and SaaS business. 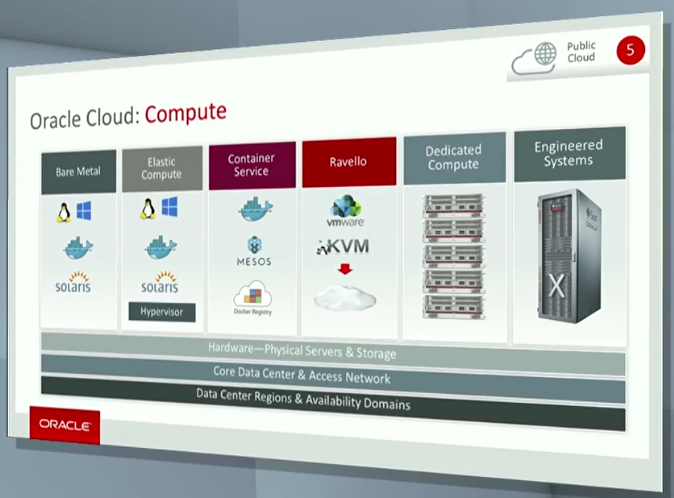 The Oracle PaaS Cloud is probably the biggest customer by far of its IaaS services. 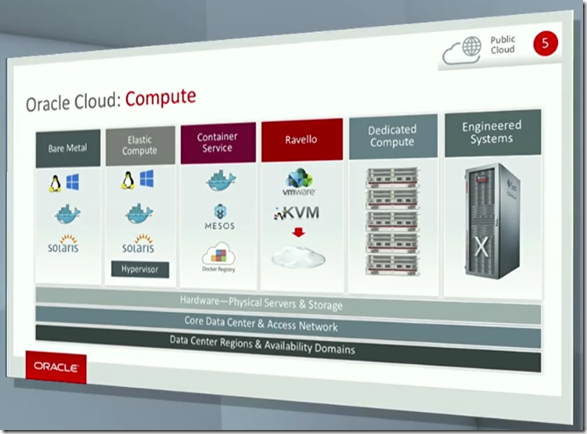 Whether or not IaaS will be big for Oracle on its own is certainly not clear yet. Customers seem interested and only a small percentage of current infrastructure spending is cloud based: there is a world to be gained. Oracle offers various types of IaaS services, broadly divided into Storage, Compute and Networking. Infrastructure is also offered in the form of on-premises product: the engineered systems. Read my previous article for details (such as Exadata SL, MiniCluster and ODA HA). The category of compute itself ranges from virtualized compute – VMs and containers – to the newly announced Bare Metal Cloud Service which is a dedicated compute service that involves huge servers being exclusively allocated to a customer with all levels access provided and the option to run a choice of operating system, hypervisor (if so desired) and workload. Bare Metal environments are provisioned through a browser in a few minutes – in a few flavors that are focused on performance for large workloads, offering very high IOPS (e.g. 4 million reads/s) using large, local NVMe. Oracle claims that Bare Metal is bigger and faster (cores, memory, storage and IOPS) as well as 20% cheaper than the largest AWS compute shape (AWS 12.8 xlarge). On the virtualized end of the compute service range a new type of service has been introduced, based on the recent Ravello acquisition. 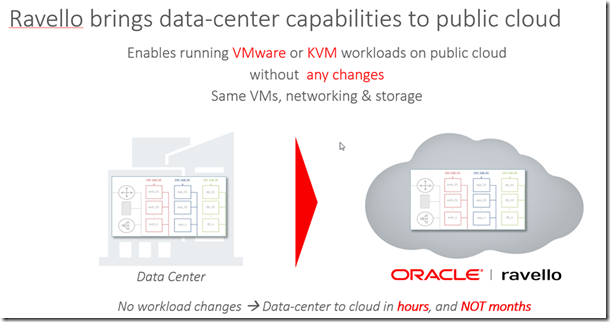 With Ravello, existing VMware workloads – constellations of ESX VMs – can be lifted and shifted to run on a public cloud – either Google or Amazon or (preferably from Oracle’s viewpoint) the Oracle Public Cloud. Ravello is a cloud product that orchestrates the workload on the selected public cloud environments – and takes care for example of all intra-VM networking. 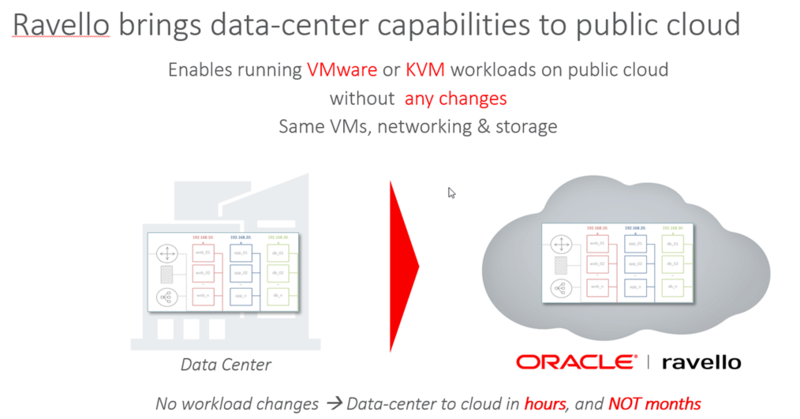 Ravello is an important element in Oracle’s attempt to eliminate corporate data centers by moving all workloads – including VMware ESX – to the cloud. Oracle offers an array of Cloud Storage options – ranging from very fast and highly active – based on NVMe – to very sedate for archived data that is only very infrequently required. 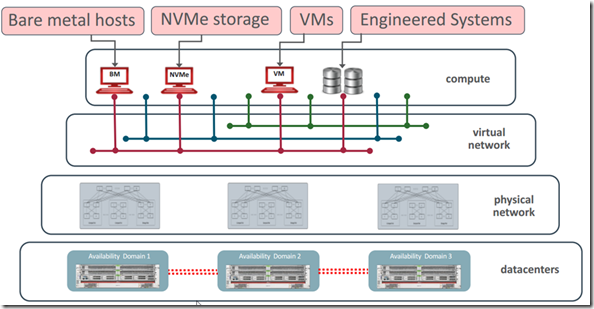 Local NVMe is available from Compute and Bare Metal via high bandwidth network within the Oracle Cloud data center, or now to be called Availability Domain. Block and Object (simple, big, cheap) storage as well as Archive are available as cloud services, available from anywhere. Oracle has made big strides to make the storage services available through various protocols to make these storage options natively accessible to back up managers and operating systems. This means that storage cloud instances can be used as regular disks or local storage devices. Protocols include AWS S3, POSIX NFS, SMB, NAS, WebDav and OpenStack Swift. The free Oracle Storage Cloud Software Appliance can be downloaded from OTN and run in a Docker container– free of charge – to copy data to and from Oracle Storage Cloud Service through standard file-based network protocols. 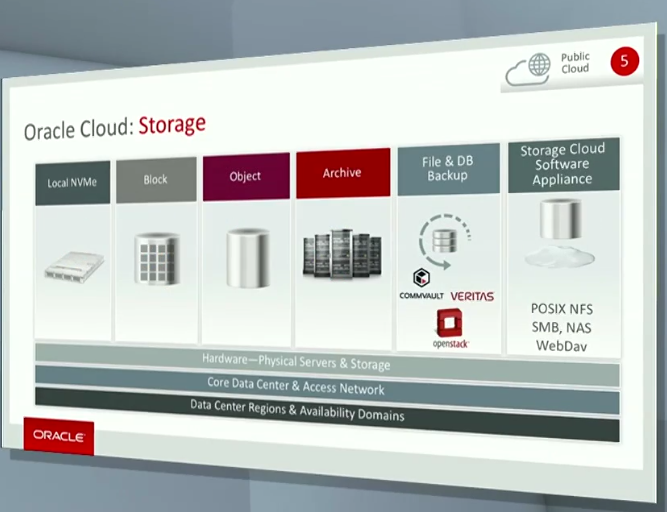 Oracle Cloud storage is based on Oracle’s own hardware appliances for storage – such as the ZFS – that are also available for on premises use in corporate data centers. 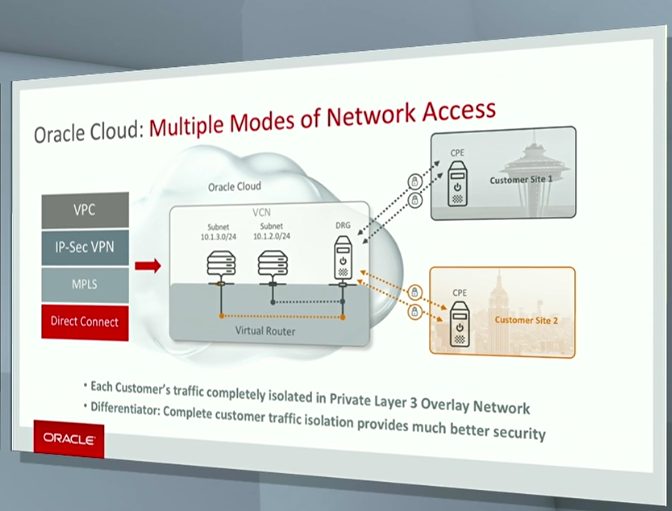 Networking is at the heart of Oracle’s IaaS offering – in several ways. Generation 2 networking architectures and technologies help provide the predictable performance inside the data centers and the extreme IOPS rates between compute nodes and between compute and storage. 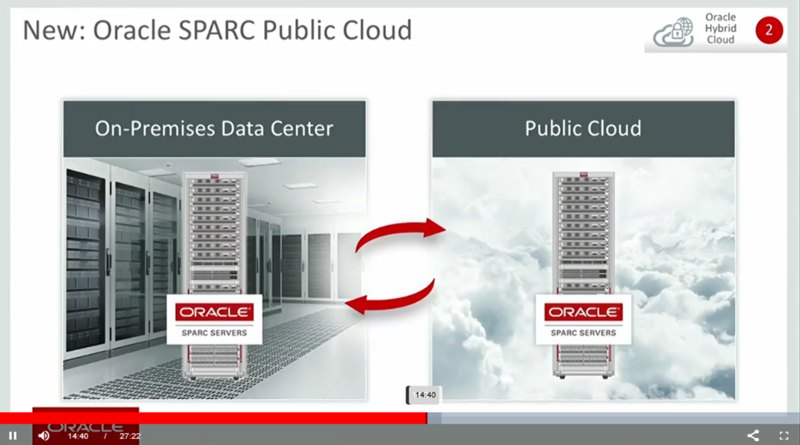 Software defined networking (SDN) inside the Oracle Data Center gives full flexibility in the network configuration. All customer specific network traffic inside the data center is completely isolated in a VCN (virtual cloud network) from other customers’ traffic, using a Private Layer 3 Overlay Network. Additionally, because of SDN, customers can bring their own IP address space to the cloud and layout applications as desired (subnets, firewalls etc.). Oracle Public Cloud provides several ways to link to corporate networks. VPN or IPSec connections can be set up and the public cloud environment can for all intents and purposes be integrated into the corporate network. 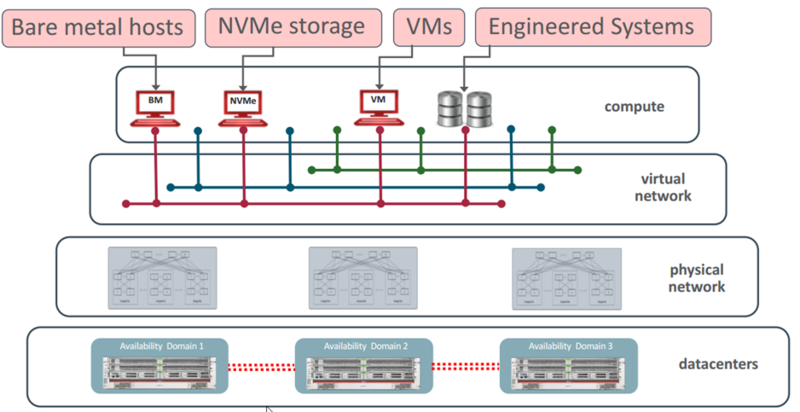 System topologies can be designed and implemented that go across public cloud compute nodes and VCN as well as the corporate data center. 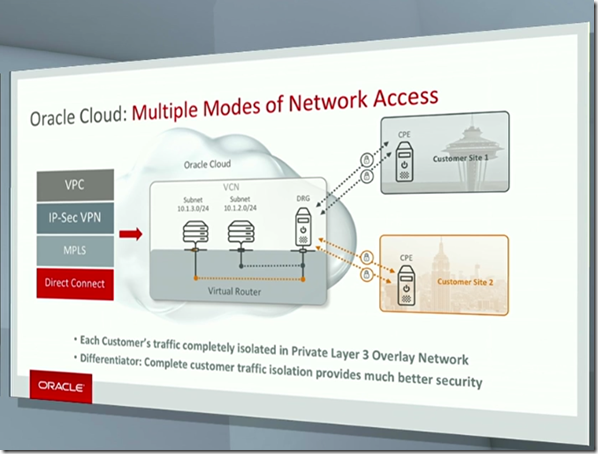 For better connectivity, Oracle offers Fast Connect (aka DirectConnect) where dedicated leased lines (for example MPLS) provide higher performing links between corporate data centers and the public cloud. A special category of virtualized compute is formed by [Docker] containers. Widely recognized as an attractive means of distributing and managing full stack chunks of functionality – virtual infrastructure, platform and application – these containers seem to have conquered the world. 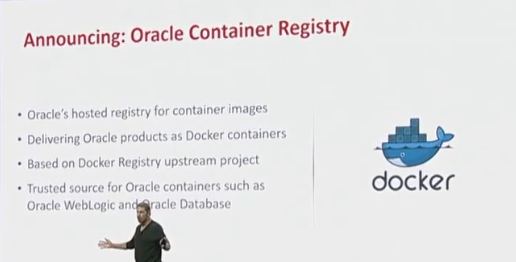 Docker can be run by customers on Oracle Compute or be leveraged (under the covers) with Application Container CS. 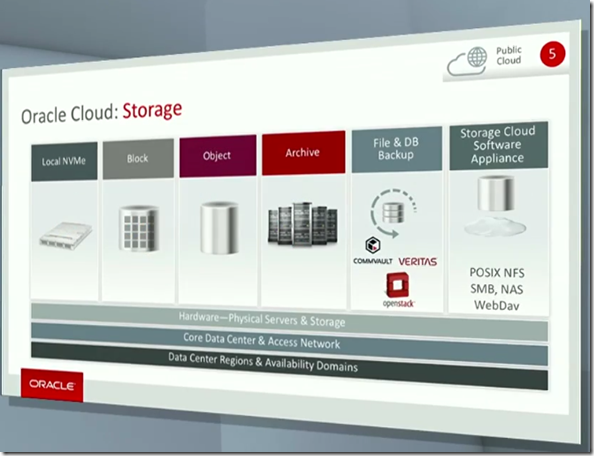 Oracle also introduces the Container Cloud Service. This services provides the framework – based on the tooling from StackEngine, acquired in December 2015 – for running and managing Docker containers and stacks of containers. Automated management – health monitoring, automatic up and down scaling, scheduled reconfiguration and self-healing deployment – is provided. 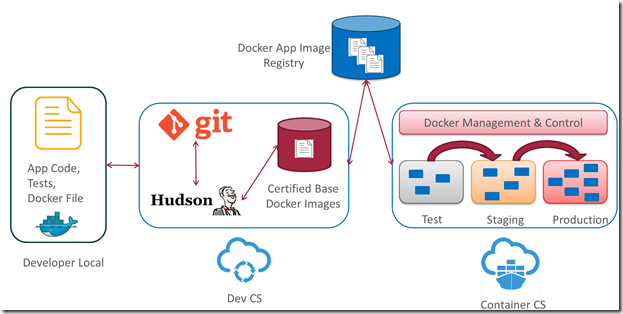 The Container Cloud Service integrates into an automated CI/CD delivery pipeline that also includes the Oracle Container Registry – a container registry server with pre-built Oracle Docker images- and a private or public Docker Image registries. 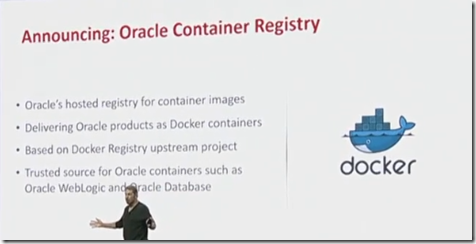 Oracle Developer Cloud Service can be at the other end of this pipeline – performing the build of the container image triggered by an application build job. 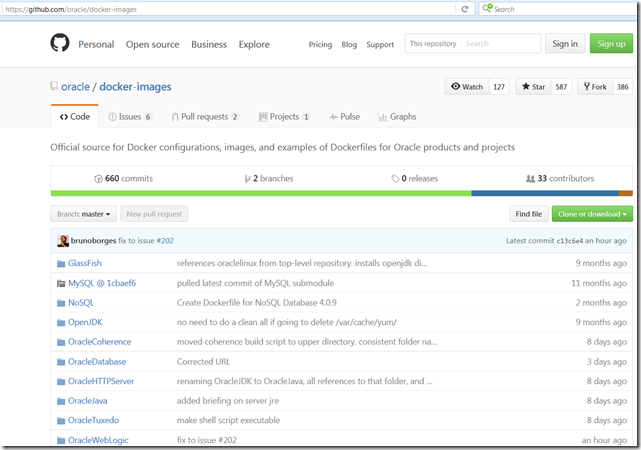 Note that Oracle does not [yet] publish Docker Images containing Oracle software – except for Oracle Linux. 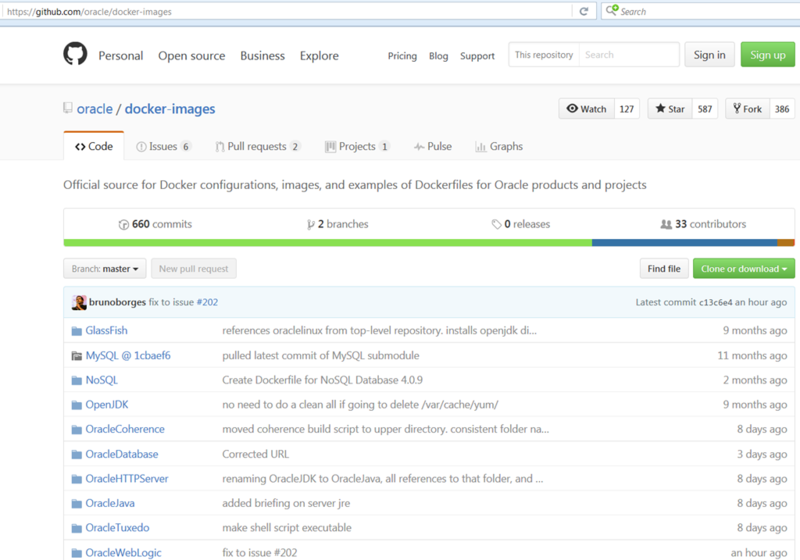 However, it does provide Docker build files (goto Oracle Docker Images on GitHub) that can be used to construct said images for various products including Java, WebLogic, NoSQL, MySQL, Database, GlassFish, Coherence and HTTP Server.